Many more of us are being diagnosed with either ‘under’ or ‘over’ active thyroid. Why? 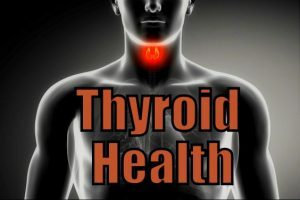 This week I’m going to be posting on what the thyroid gland is, where it is, what it does, what’s a goitre, and why many of our thyroid glands have recently become very unhappy. This week I’ll share with you ways to treat it well, naturally. Around one in 20 people will experience some form of thyroid dysfunction in their lifetime. Women are more susceptible than men. It ‘s a gland that secretes hormones to regulate many processes – including growth and energy expenditure. If it’s overactive (hypER) or ‘sluggish’ (hypO), your metabolism will be affected, leading to a variety of symptoms that can be mistaken for other health issues in the body. HypO-thyroidism (not making enough thyroid hormone) can lead to feeling sluggish, thinning or coarse hair, weight gain, lacking concentration, have dry skin, muscle pains or cramping, fluid retention and sensitive to cold temperatures. HyPER-thyroidism (making too much) may lead to unexplained weight loss, sleeping difficulties, increased heart rate, sensitivity to heat, irritability, nervousness or anxiety, and diarrhea.